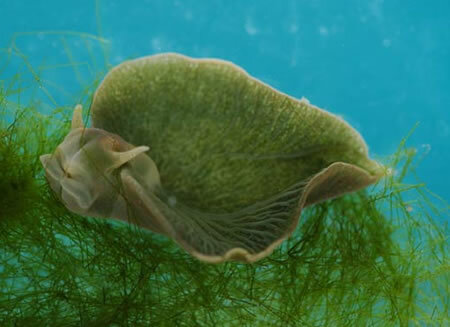 Elysia chlorotica is an unusual sea slug. Not content to eat algae that have mastered the art of photosynthesis, e. chlorotica appears to have stolen the genes that make it possible. This little sea slug converts sunlight to energy all by itself. "They can make their energy-containing molecules without having to eat anything," said Sidney Pierce, a biologist at the University of South Florida in Tampa. Pierce has been studying the unique creatures, officially called Elysia chlorotica, for about 20 years. He presented his most recent findings Jan. 7 at the annual meeting of the Society for Integrative and Comparative Biology in Seattle. The finding was first reported by Science News. We collect them and we keep them in aquaria for months," Pierce said. "As long as we shine a light on them for 12 hours a day, they can survive [without food]." Rely on endlessly inventive Nature to come up with these amazing ideas. And, we can also rely on inventive science fiction writers. You've surely noticed the green skin tone of your new body. This isn't merely cosmetic. Your new skin (KloraDerm) incorporates chlorophyll to provide your body with an extra source of energy and to optimize your body's use of both oxygen and carbon dioxide. The result: You'll feel fresher, longer - and better able to perform you duties as a CDF serviceperson! From LiveScience; thanks to muj0 for the tip and the reference.